I'm a sucker for the kind of 'how can you do that?' 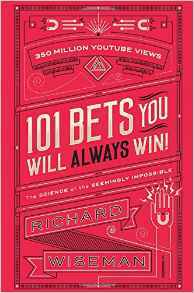 challenge that featured regularly as ways to win bets on the TV show Hustle - so when I saw Richard Wiseman's new book I was so enthusiastic to lay my hands on it, I bought it with my own money. (Thankfully at an over 50% discount, as the list price is very steep for what it is.) I certainly enjoyed it, but it was also a little bit of a let down. Psychologist Wiseman has made something of a speciality of 'quirkology' - the psychology of human quirks that lies behind our ability to trick each other, so when the subtitle promised 'the science behind the seemingly impossible' I expected plenty of good pop psychology on why we were taken in by this kind of thing. But in practice the slim book is mostly the tricks with just a few bits of interpolated trivia - the only sizeable bit of fact was about the history of the safety match. I read the entire book on a 45 minute train journey, though without, of course, trying out the betting tricks. I'm not sure whether I will or not - the trouble is, although the tricksters of Hustle look extremely smooth when they pull this kind of trick in a bar, in reality you are likely to look something of a prat if you try it on your friends down the pub, and most of us wouldn't try it on complete strangers, the only way to successfully make use of it to win money. Sadly, most likely, we will be exposed to children doing these tricks on us and will have to seem pleased and amazed. The only one I might try is the hundred-and-first trick, Wiseman's confessed favourite. Strictly speaking it's a magic trick rather than a psychological one, as it requires a prepared misleading prop - but it is very entertaining. this sentence), the only novelty being the word wasn't 'the', and the 'balance a glass on three knives balanced themselves on three glasses' trick which appeared in the copy of de Bono's Five Day in Thinking that I was given as a present 50 years ago. There were also rather too many problems that required irritatingly unnecessary accuracy of language - for instance, one where the mark is challenged to balance an orange on the top of a glass that is on a table bottom upwards. When they balance the orange, you claim to win as they've put the orange on the bottom of the glass, not the top. Even so, there were enough novel challenges here that I still think the book is worth buying (and inevitably it would make an excellent stocking filler), especially if you try some of them out. I don't know if it's because I'm an impoverished writer, but I was particularly taken with some of the tricks involving bank notes, and both static electricity and surface tension have roles to play in some of the more imaginative challenges. Don't expect, then, that these are going to be tricks that blow your mind. They mostly are done with everyday items (though I would probably avoid doing the ones involving lighting matches in a smoke-free pub) - in some the only prop is the human body - but it is entertaining to challenge yourself to work out the solution, where the challenge is not just 'do this' where you can't. And in some cases it's definitely worth having a go, even if it's probably best to do so solo to avoid embarrassment.